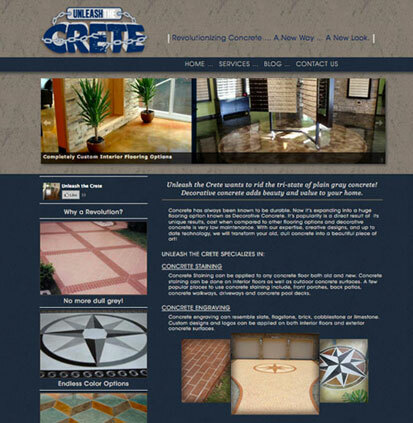 Content Managed Website developed for decorative concrete company Unleash the Crete. This site was developed to showcase the endless options of concrete. While the services are explained, the process is better understood when seen. Catherine, president of Unleash the Crete, wanted to share her knowledge and experience through a clear and easy to navigate blog design. Busy as we all are, I offer blog services to help the promotion of businesses while my clients are out maintaining their customer base. 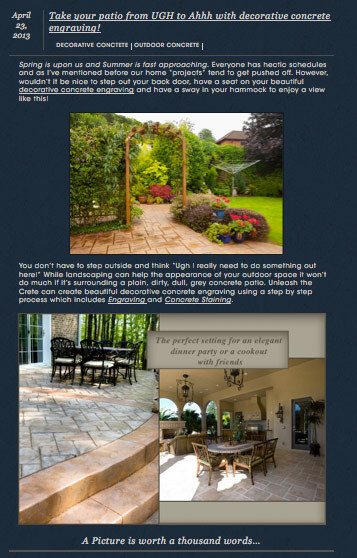 As mentioned earlier, the possibilities for decorative concrete are endless. I used very straight forward design to showcase the images of concrete in many different settings. When designing and coding this website we wanted to make sure all services were mentioned right away. 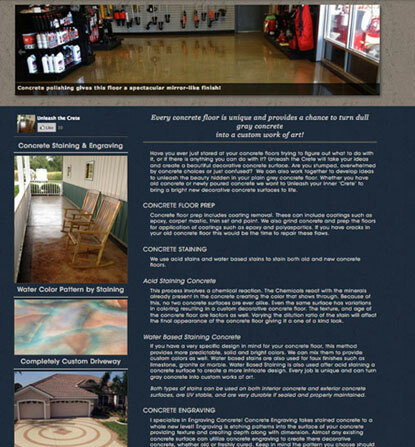 By linking each header to its appropriate description on the services page I enhanced the SEO (Search Engine Optimization) and helped the reader find more information to better understand the decorative concrete process. This blog design is not only a way to share information, it’s a way to connect with potential customers. Having and maintaining a consistent blog lets people know, before even calling, you are educated in your field. By maintaining this blog design and posts I am able to ensure each post is optimized for the best search engine results and help to grow Catherine’s business.